Keeping the alliance strong will require adroit diplomacy on the part of both South Korea and the U.S. This is the fourth article in a series on the U.S. alliance with South Korea. Previous articles can be found here, here and here. In an Asan Institute poll from 2014, 93.3 percent of South Koreans polled said the alliance was necessary, and 66 percent percent were in favor of retaining the alliance even if Korea unifies. However, ROK opinion of the United States is mercurial: In a 2002 survey, 44 percent of South Koreans had a negative view of the United States, a number higher than any other Western or Asian country. Much of this anti-Americanism is rooted in the U.S. military’s role in South Korea. There are historical reasons for this anti-Americanism, including misperceptions surrounding the U.S. military’s role in the Kwangju massacre in 1980. There have also been several recent sensational instances where individual U.S. soldiers have killed or harmed South Korean civilians, provoking anger and questions about the Status of Forces Agreement that permits the United States to try American perpetrators in U.S. military courts. The ROK was under authoritarian rule for much of its early history, until the 1987 election of President Roh Tae-woo. Despite this, the U.S. maintained the alliance. During the authoritarian period, many Korean college students started to perceive the United States as being more interested in fighting communism than protecting freedom or democracy. The locus of this perception is the Kwangju Massacre and U.S. support of ROK President Chun Doo-hwan. Chun took power in December 1979 through a military coup. Beginning on May 18, 1980, there were large pro-democracy protests in the city of Kwangju. The ROK military used paratroopers to put down the protests, resulting in as many as 2,000 civilian casualties. The Chun administration made the decision to use the military, but it was widely assumed that the United States approved of the move because the Korean military was under the operational control of the U.S. military command. Under this arrangement, the U.S. was supposed to approve any movement of South Korean troops. The United States was slow to attempt to correct these misperceptions, waiting until 1989 to release a white paper detailing the lack of American complicity in the massacre. Adding to anger against the United States was U.S. President Ronald Reagan’s decision to invite Chun to the United States in 1981. Again, this visit created misperceptions of U.S. support for the massacre and for ROK authoritarianism; in fact, the summit meeting between the two presidents was based on a secret deal to induce Chun to spare the life of prominent dissident and future president Kim Dae-jung. The misperceptions of U.S. support for Chun and the killing of Korean civilians in Kwangju still persist in Korea, and form a historical backdrop for anti-Americanism. In the aftermath of the Kwangju massacre, the 1980s were a high point of anti-Americanism in South Korea. A segment of ROK society believed in the narrative that the United States was a ruthless hegemon. They based their view of the United States on historic incidents where they thought that the United States acted selfishly to protect its interests in the region rather than protecting Korea. There are many historical issues that support this perspective, such as the U.S. failure to prevent Japanese imperialism in 1910 despite the 1882 Treaty of Peace, Amity, Commerce and Navigation, U.S. involvement in the division of the Korean Peninsula after WWII, and U.S. support for authoritarian ROK leaders who suppressed dissent from the left and used violence to maintain power. This narrative is not based on fiction, but on a biased reading of actual history. Because of its basis in fact, this view is powerful, and requires the U.S. to own up to its mistakes, but also for the ROK to realize that the United States, despite acting on its perceived national interests, has contributed to the security and well-being of the ROK through the sacrifices of the Korean War, and through development aid. Cases of rapes and murder committed by U.S. forces in South Korea are another source of continuing anger. One example is Private Kenneth L. Markle III, who was arrested for killing and torturing a South Korean bar worker. This incident caused anti-American riots, and resulted in Markle being tried in a Korean court instead of a U.S. military court*. He originally received a life sentence, later reduced to 15 years. In 2011, American soldiers committed three high profile crimes, including two rapes and an assault on a 70-year-old woman. In the aftermath of these three events, many South Koreans again called for American troops to leave the country. The most notorious of the three cases involved Pfc. Kevin Flippin, who sexually assaulted an 18-year-old Korean woman for three hours. In this case, the military turned Flippin over to South Korean courts, which handed down a ten-year sentence. U.S. officials claim that the rate of crimes committed by U.S. forces in Korea is actually low given the number of soldiers present. Yet criminal behavior will remain a sensitive issue as long as the U.S. military remains in South Korea, and the United States has shown an increasing willingness to allow South Korea to try its service members for crimes committed off-duty. The South Korean media has a tendency to exaggerate rates of criminality by American forces, which needlessly causes resentment and damages the alliance, while ignoring U.S. military attempts to reduce crime, such as imposing curfews on soldiers stationed in Korea. Today, ROK perceptions of the United States and the U.S.-ROK alliance are strongly positive, but as history has shown, this can easily change. Numerous incidents in the past have provoked rampant anti-Americanism, and future controversies involving U.S. service members are inevitable. In addition, even when overall perceptions of the United States is positive in South Korea, there exists the possibility of individual acts of violence against Americans by South Korean citizens. One prominent recent example is the March 5, 2015 knife attack against the U.S. ambassador to South Korea, Mark Lippert. Kim Ki-Jong, a South Korean activist, attacked Lippert while screaming that the two Koreas should be united, later claiming that his act was a protest against U.S.-ROK joint military exercises. 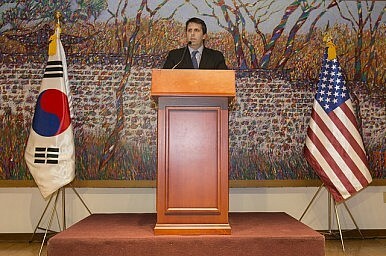 In the aftermath of the attack, Lippert went to great lengths to show the strength of the alliance, even after the attack against him, sending a Twitter message soon after the incident saying “Doing well and in great spirits… Will be back ASAP to advance US-ROK alliance!” In South Korea, most Koreans reacted by showing tremendous support for Lippert and the U.S.-ROK relationship, with President Park Geun-hye visiting the ambassador in hospital. However, a counter-narrative saw the outpouring of support for Lippert and the U.S. as a crass political move by conservative ROK politicians to attack critics as “pro-North Korean,” and to increase domestic support for the U.S.-ROK alliance. The fact that a vicious attack on a U.S. ambassador did not threaten the U.S.-ROK alliance is a testament to its strength, but it would be naïve to assume that incidents in the future will not have greater repercussions. Lippert’s positive response in the aftermath of the attack is a testament to his character and his diplomacy. To maintain the strength of the alliance in the future, it will require adroit diplomacy, such as that shown by both the U.S. ambassador and the South Korean president in this instance. It will also require a strong narrative for both the U.S. and ROK public that allows people of both nations to understand each other and to see the alliance as mutually beneficial rather than as a form of exploitation or parasitism. This narrative should focus on shared interests as well as shared democratic and social values, and should come from both official and unofficial sources in the United States and in the ROK. *The original suggested that Markle was the first U.S. soldier to be tried in a Korean court. Apparently, this is not correct. What might happen to America's alliance with Korea in the event of reunification? Who’s Right About the New US-South Korea Joint Military Exercise?US, South Korea Call Off Foal Eagle and Key Resolve Exercises, Announce New ExerciseWhat Does the Signed Cost Sharing Agreement Mean for the US-South Korea Alliance?US Special Envoy in Korea for Talks Ahead of Trump-Kim summitThe US-South Korea Military Cost-Sharing Agreement Has Expired. Now What?